“My recollection of fasting during The Great Lent is abstinence of meat on Wednesday, being the day Judas made his bargain to betray Christ, and Friday, his crucifixion.” This is how Katherine Zikakis, a member of the Greek Orthodox Church, explained her Lenten traditions to her daughter Stephanie Teague, of Ann Arbor. Use the freshest fish you can find, from a trusted fishmonger. Vegetables centered on parchment, and aromatics for the fish cavity prepared. Center scored and seasoned fish over vegies. Wrap in parchment paper, then into the oven! I developed the following recipe with Katherine’s weekends in mind. Stephanie said her mother and grandmother scored the skin and flesh on both sides on a diagonal with a sharp knife in three places – always three, even if the fish were tiny. Then, the fish went into a broiler pan, “lined up like little soldiers”, drizzled with a mixture of lemon juice, olive oil, oregano, and garlic, then broiled about 10 minutes. Fortunately for us, whole fish can be found in many seafood counters about town. I decided to bake a fish, plaki-style (the Greek technique of smothering a food in herbs and vegetables before cooking), and baked it in paper – en papillote – to trap the savory juices. Mike Monahan, owner of Monahan’s Seafood, suggested Orata, a wildly popular fish in the Mediterranean region. It’s rich buttery flavor and high meat to bone ratio, was outstanding in this preparation. The General Manager of Real Seafood, Barb McCoy, says their restaurant is quite busy during the Lenten season. If you’d like to try a whole fish without the fuss, the restaurant offers char grilled Branzini, a Mediterranean sea bass, seasoned with olive oil, garlic, lemon and oregano; Katherine must have shared her recipe. Steamed rice is perfect for soaking up the delicious juices from the vegetables and fish. Combine fennel, peppers, tomatoes and olives. Set aside. Cut 2-3 sheets of parchment paper, one per fish, large enough to completely wrap around the fish with extra paper at ends to twist. Divide and center the vegetable-olive mixture on top of each piece of paper. Wash and dry the fish. With a sharp knife, score the fish on 1 side by cutting three slits into the flesh. Season fish, inside and out with kosher salt and freshly ground pepper. Center fish on top of vegetables, scored side up, and stuff the inside of the fish with garlic, oregano and lemon slices. Drizzle lemon juice and 2 tablespoons olive oil over each fish; enclose fish with paper by twisting ends together. (Fish may be prepared to this point several hours and refrigerated prior to cooking.) 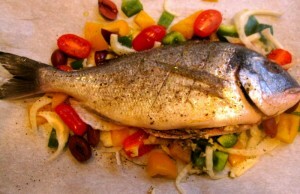 Place on baking sheet and cook on center rack of oven 15-25 minutes, or until fish is white to the bone. Combine feta and parsley. Each “bundle of joy” may be placed on individual platters for serving. 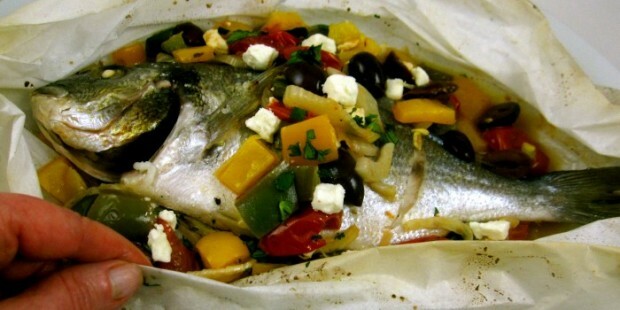 Diners may open package at the table, then sprinkle parsley-feta mixture over fish, as desired.